Designed in 1838 by Alexander Jackson Davis, the house was owned in succession by New York City mayor William Paulding, Jr., merchant George Merritt, and railroad tycoon Jay Gould. In 1961, Gould's daughter Anna Gould donated it to the National Trust for Historic Preservation. It is now open to the public. The house was first named "Knoll", although critics quickly dubbed it "Paulding's Folly" because of its unusual design that includes fanciful turrets and asymmetrical outline. Its limestone exterior was quarried at Sing Sing in present day Ossining, New York. The second owner, Merritt, doubled the house's size in 1864-1865 and renamed it "Lyndenhurst" for the estate's linden trees. His new north wing added an imposing four-story tower, new porte-cochere (the old one was reworked as a glass-walled vestibule) and a new dining room, two bedrooms, and servants' quarters. Gould purchased the property in 1880 for use as a country house, shortened its name to "Lyndhurst" and occupied it until his death in 1892. Lyndhurst’s 67 acres are free to pedestrians accessing the grounds via the Old Croton Aqueduct State Park. Please note, there is no available street parking in the area near Lyndhurst. 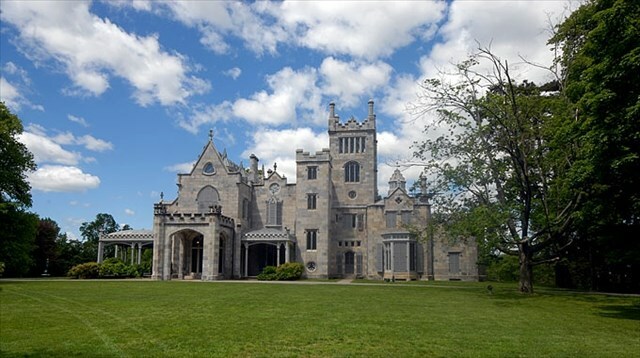 Vehicles On Weekends from Memorial Day through the end of October and on holiday Mondays, Lyndhurst charges a $5 per person fee to visit the grounds via vehicle. Bus groups must also pay $5 per person at all times. At all other times, Lyndhurst’s grounds are open from 9am to 5 pm and may be visited for free. This is a 2 Stage Multi-Cache. Nothing is placed at the posted coordinates, they will bring you to the Front of a Small Structure. All the answers needed to find the Final Location will be provided here.